To conduct a systematic review and meta-analysis in children with syndromic craniosynostosis, to evaluate the effect of adenotonsillectomy for the treatment of obstructive sleep apnea (OSA). Data sources: a comprehensive search of PubMed, SCOPUS, Ovid Medline, and Web of science databases was performed through June 22nd, 2018. Manual searches and subject matter expert input were also obtained. 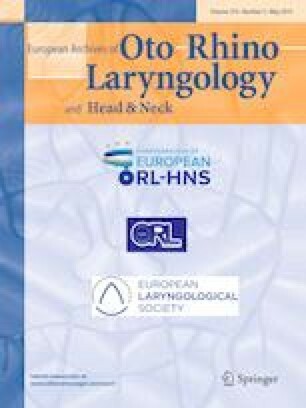 This article includes studies assessing the effectiveness of adenotonsillectomy in syndromic craniosynostosis children, in which apnea–hypopnea index (AHI) or oxygen desaturation index (ODI) was reported. A total of 3 retrospective studies (24 patients) met the inclusion criteria. Pooled random effect analysis did not identify a statistically significant difference between preoperative and postoperative AHI. But there was an overall reduction of AHI of 5.00 events per hour [95% confidence interval (CI) (– 17.79, 7.79); P = 0.44]. However, the fixed effect model demonstrated a statistically significant difference between preoperative and postoperative ODI with an overall reduction of 8.5 per hour [95% CI (– 15.01, – 1.99); P = 0.01]. Adenotonsillectomy showed benefits for the treatment of OSA in syndromic craniosynostosis children, in terms of AHI and ODI. However, only ODI, but not AHI, reached statistical significance. Data were based on meta-analysis of retrospective reviews. Further studies that are conducted at multiple centers are needed to confirm the benefits of adenotonsillectomy for the treatment of OSA in syndromic craniosynostosis children. The authors would like to thank Miss Narumol Jariyasophit and Mr. James C. Moran for their generous contributions to this manuscript’s English editing.